This page shows the latest 3 Monkeys news and features for those working in and with pharma, biotech and healthcare. 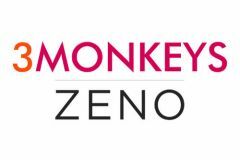 Zeno Group has acquired 3 Monkeys Communications to accelerate its global expansion, with the expanded agency to be known as 3 Monkeys | Zeno. ... With 3 Monkeys | Zeno, we now have a more powerful platform from which to grow in Europe and beyond.”. David Berkovitch, Head of Healthcare at 3 Monkeys Zeno said: “We’re thrilled to be nominated for the Getting Some? ... About the healthcare team at 3 Monkeys Zeno. Helping healthcare companies create human connections to improve human care. David Berkovitch, Head of Healthcare at 3 Monkeys Zeno commented, “With the NHS App rolling out in the coming months, the dream of Uber-esque access to primary care within the ... 44 (0) 20 7009 3100. Address:. 3 Monkeys Zeno. THE LIGHTBOX. 44 (0) 20 7009 3100. Address:. 3 Monkeys Zeno. THE LIGHTBOX. 3 Monkeys Zeno is an award winning global creative communications consultancy – home to a collective of creative and strategic thinkers from every conceivable marketing background. ... Address:. 3 Monkeys Zeno. THE LIGHTBOX. 127-133 Charing Cross Road.